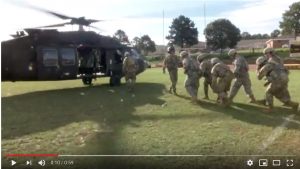 GRAMBLING, LA – Oct. 19, 2018 – Two U.S. Army Blackhawk Helicopters landed today at Grambling State, transporting more than 40 ROTC students to Fort Polk as a part of a military training exercise at 9:45 am and 12:00 pm CST. The MS3 Army ROTC cadets, who are all contracted and on scholarship to become Army Officers, joined the exercise; transporting them from the University’s old football stadium (which now houses track and field competitions) to Leesville, Louisiana. The rare military training is part of preparation for a Summer 2019 Army Officer certification exercise scheduled to take place at Fort Knox in Kentucky. Cadets who complete certification will enlist in as Army Officers in the National Guard, Reserve or on Active Duty. For more information on Grambling State ROTC, visit http://www.gram.edu/military/. This entry was posted in academics, campus, gramstory, press release on October 19, 2018 by Jovan Hackley.